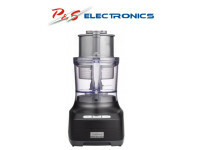 The Samsung VU7000 Motion Sync includes the Fully Detachable Handheld that completely detaches from the main body. 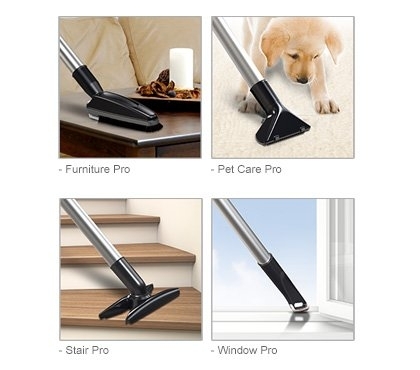 So its suitable for cleaning even awkward and hard to reach areas like corners, ceilings and stairs, without being hampered by having to stretch a hose, pull around the whole vacuum cleaner or worry about it toppling over. 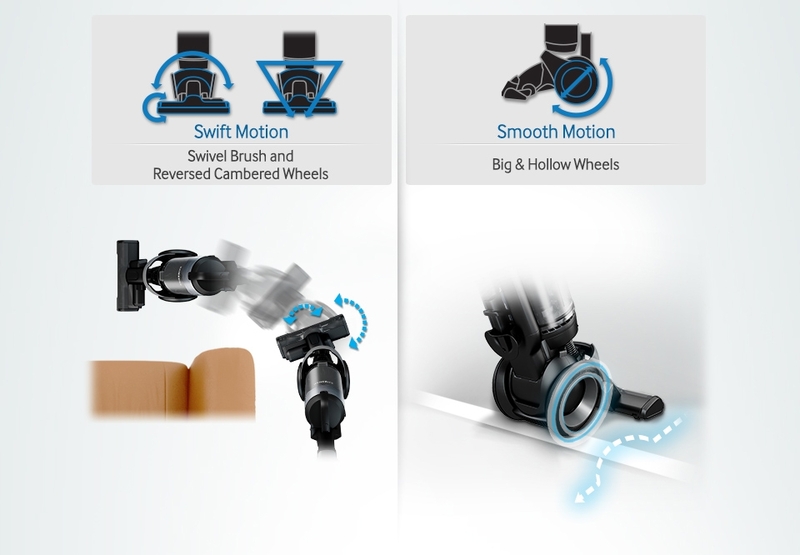 The Samsung Motion Sync upright vacuum cleaner features Motion Sync Design with a swivel brush and reversed cambered wheels. The combination of the two features ensures exceptionally easy movement and makes swift motion for sudden turns much easier. Also, the wheels are big and hollow to enable a smooth motion, so they roll steadily and easily with minimum effort. The Samsung VU4000 Motion Syncs innovative CycloneForce multi features a unique interior structure with nine inner chambers that create a multi cyclonic airflow. 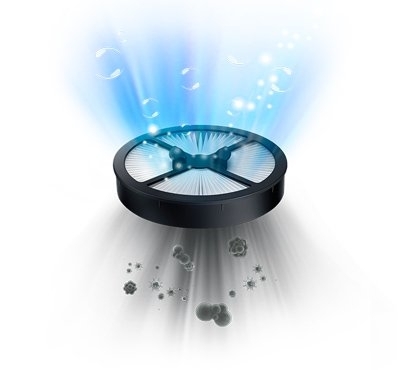 Its strong centrifugal force separates dust particles and debris from the air and keeps them from leaving the chamber. 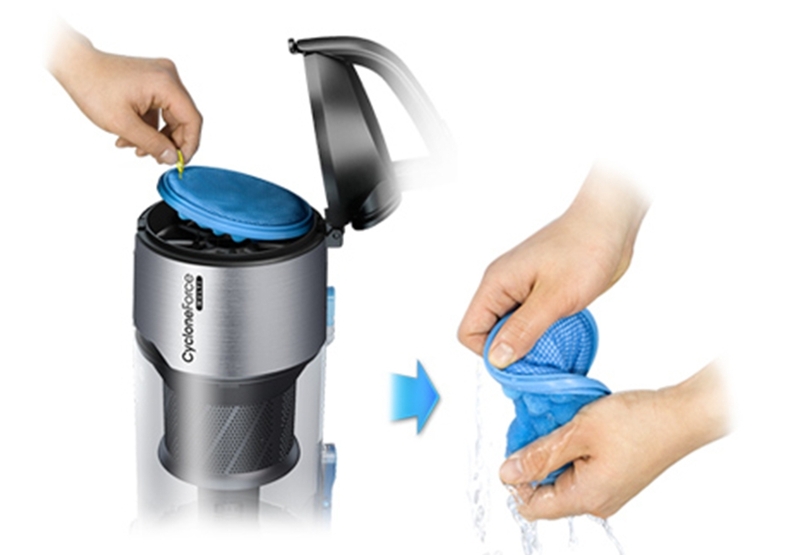 So it prevents the filter from clogging to maintain powerful suction for a long time. The Samsung vacuum cleaner has a simple, sponge type foam filter that captures dust and can be easily washed and cleaned with water. A quick rinse is all it takes to prevent the filter from clogging which ensures powerful suction that lasts and great results. 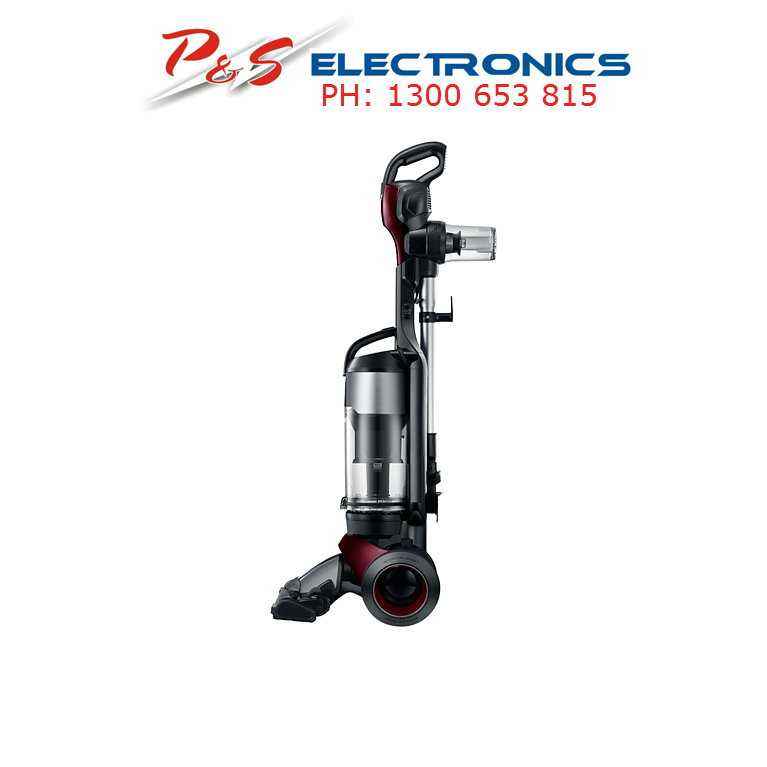 In addition to a 1,200W main motor and a powerhead motor in the brush, the Samsung VU7000 Motion Syncs Tri-Motor System has an additional 470W motor in the Fully Detachable Handheld for extra power. The 3 independent motors work for optimum cleaning. 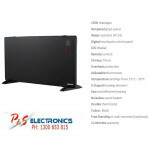 So you can enjoy a truly efficient and effective overall performance on various kinds of occasions and surfaces. 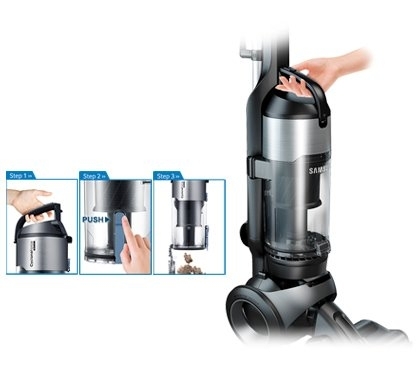 The Samsung vacuum cleaners bagless dust bin is simple to empty without spilling dust back on the floor. 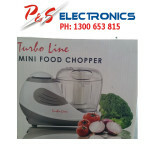 You can quickly open it with the push button, tip the contents into the trash can and then effortlessly slide it back. Plus its easy to take out the filter and wash it with water. * Tested on VU4000 Motion Sync. Based on internal test conducted in accordance with IEC60312-1-1. Based on internal data. Regular filter washing is required for optimal performance. Refer to the user guide for details. 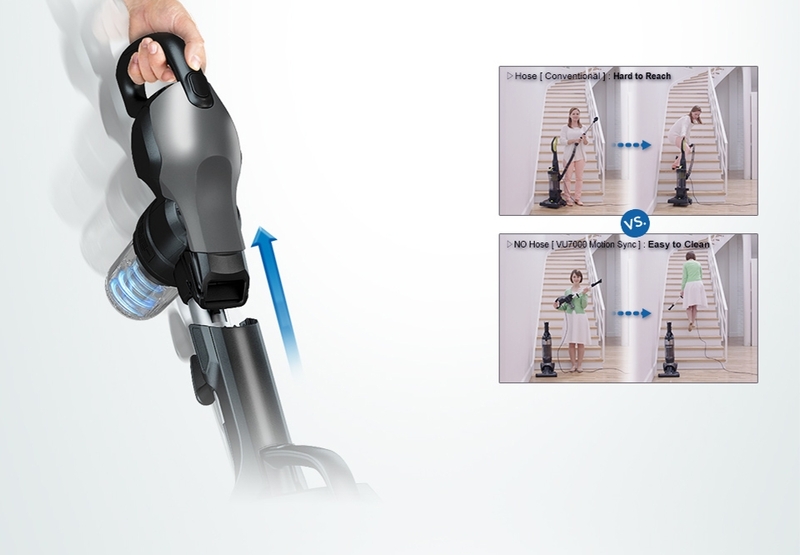 The Samsung vacuum cleaner features an advanced anti-allergy and hygienic filtration system approved by the Asthma and Allergy Foundation of America (AAFA). 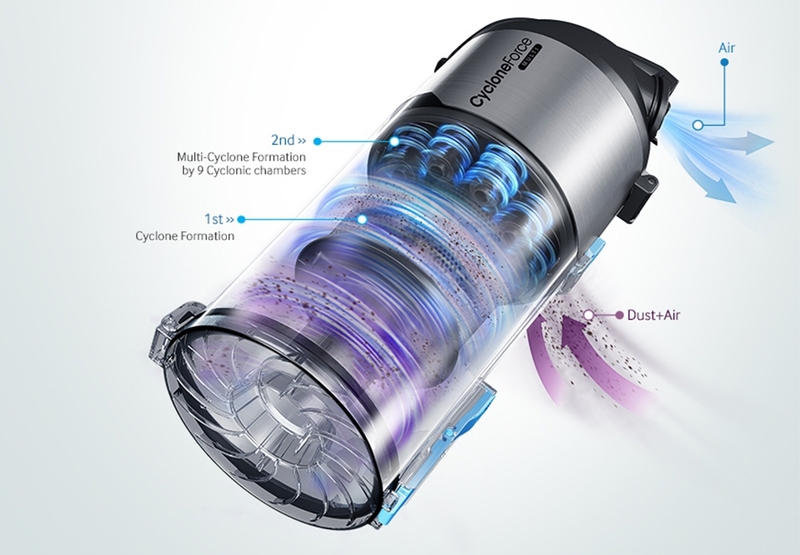 The Hepa filtration not only removes dust and dirt, but also captures of air-borne allergens. 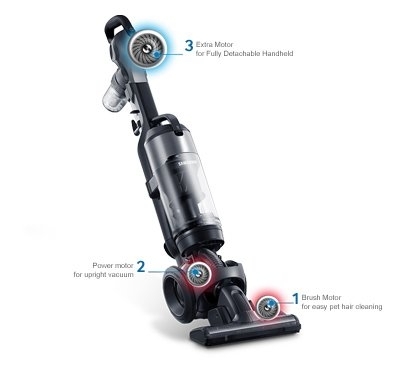 The Samsung VU4000 Motion Sync has different kinds of accessories in Pet Cleaning Kit to suit a variety of cleaning needs, especially for people with pets. These specialist fittings feature different shaped heads that are specifically designed for those areas with pet hair and that are difficult to clean like furniture, stairs and windows. So you will get great results, with much less time and effort.